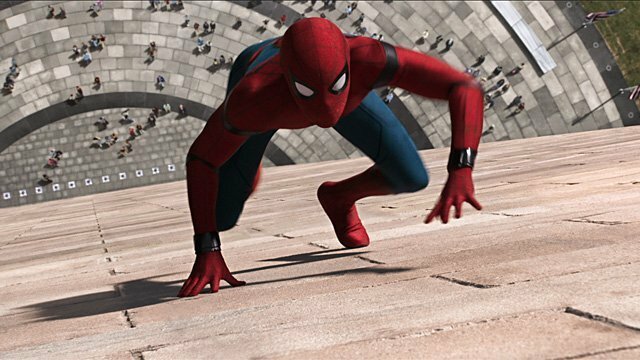 After spending some time in Europe, principal photography on Spider-Man: Far From Home picked up in New York City this week. Thanks to a large handful of Instagram users, we have our first glimpse at a new costume that Peter Parker will be wearing in next summer’s highly anticipated sequel. The scene being filmed shows Spidey (presumably Tom Holland under the mask, although it could also be a stunt double) swinging around with Zendaya’s Michelle/MJ. You can check out the video (via ComicBook.com) below. Of course, this isn’t the only new suit that Peter will be wearing for his next adventure. Last month, set photos showed the webslinger perched on top of a Ferris wheel wearing what looked a lot like a stealth-based costume inspired by the comics. The latest suit isn’t a big departure from the Tony Stark-designed threads we’ve seen Peter sporting since his first MCU appearance in Captain America: Civil War. The biggest difference is that it trades in the character’s trademark blue for a black motif, with some extra black added to the gloves. Additionally, there’s a white spider emblem on the back that mirrors the symbol on the front. The suit calls back to several previous designs, including famed comic artist Alex Ross’ design for the original Spider-Man film trilogy as well as some of Marvel Studios’ visual development head Ryan Meindering’s unused concept art. However, a number of fans have pointed out that the revamped color scheme also resembles the costume worn by Otto Octavius (in Peter Parker’s body) during the Superior Spider-Man comic book series. The argument could also be made that it adheres more closely to Spider-Man’s appearance in Amazing Fantasy #15 back in 1962. Spider-Man: Far From Home swings into theaters on July 5, 2019. What do you think of the new suit? Let us know what you think in the comment section below!